Vivid, tactile, provocative, playful, contemplative – our annual selection of the best new UK graduate talent evokes curiosity and delights the senses! Adrienn Pesti, Glasgow School of Art - has crafted her collection to counteract social isolation by appealing to people across all ages and backgrounds through their senses. 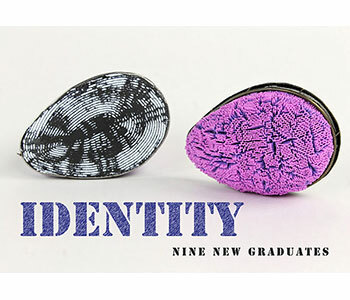 Silk clay in vivid pinks, greens and blues is forced through grids creating wonderfully curious surfaces in a delightful series of brooches and necklaces that just cry out to be touched! Isla Christie, Glasgow School of Art - makes use of digital tools to explore the infinite possibilities of geometric forms. Working in silver and paper, she has developed a method of ‘slicing’ her digital 3D models to create items of jewellery made from layers of cut paper. Her modular collection of primary coloured earrings and pins are not only kinetic but have interchangeable parts encouraging lots of playful interaction by the wearer. Miki Asai, Glasgow School of Art - her contemplative collection of mosaic brooches finely crafted from fragments of eggshell, seashell, mother of pearl and lacquer show her clear Japanese aesthetic. The poetically titled Colour of Wind brooch is a particularly captivating example, ephemeral, exquisite, light as a feather and extremely wearable! Song Wang, Birmingham School of Jewellery - in her intriguing collections Emotion Dialogue and Insecure Song Wang explores our often hidden feelings of anxiety. Dramatic protective cuffs and chokers made from heat sensitive infused acrylic change colour in reaction to our body temperature and modular rings can be changed to become earrings or brooches as we fiddle to help manage our feelings. Jewellery as an aid to greater self knowledge and acceptance! Hayley Grafflin, Sheffield Hallam University - Hayley is inspired by often overlooked hidden beauty - peeling paint revealing every shade of orange rust imaginable, soot covered London underground pipes – these observations permeate her restrained collection of jewellery each piece a painterly composition crafted from carefully chosen wood, paper and oxidised silver with the occasional flash of orange paint! 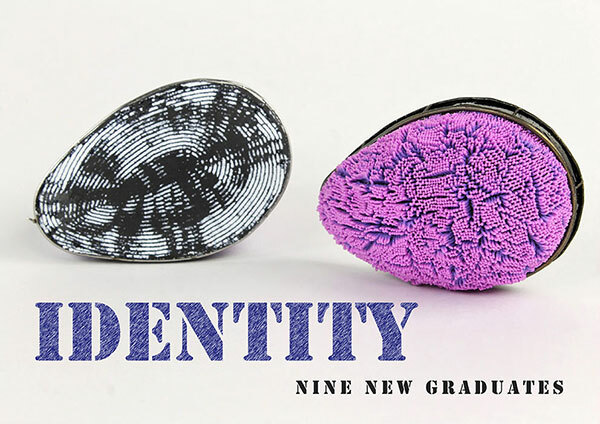 Mara Balode, Glasgow School of Art - photographic fragments of urban environments are transposed onto tiny acrylic squares and woven into wonderous flexible structures making an eminently wearable collection of jewellery. Mara wants to depict ‘an impression of an ephemeral world vanishing in the sunlight’. Evgeniia Balashova, Glasgow School of Art - is inspired by office spaces and the abundance of repetitive features found within them. Stationary, computer hardware, identical furniture - all appear in perfect order until human intervention turns them into organised chaos. Her gently compressed Under Pressure brooch in pastel painted 3D printed nylon and silver captures this mix of order and chaos beautifully. Hannah Lornie, Glasgow School of Art - a microscopic observation of lichen, it’s textures, colours, patterns is inspiration for a complex series of jewellery pieces cleverly crafted from a merger of precious and non-precious materials, paint, thread, silver and acetate – a material exploration of what we value and why. Paula Treimane, Glasgow School of Art - a supremely elegant collection of jewellery arising from her extensive exploration of natural materials wood, silver, bone, rubber and thread, highlighting their interplay and intrinsic values. She specializes in techniques such as wood carving and experimental lost wax casting, testing the limits of her materials and transforming them into unique forms and compositions. Mara Balode, Glasgow School of Art; Isla Christie, Glasgow School of Art; Paula Treimane, Glasgow School of Art.